The goal? Trigger based direct marketing hits the right person with the right message at the right time. The method? Use action-based data in a timely manner so a targeted direct mailpiece can be sent to the customer/prospect within a specific window of opportunity. Trigger campaigns are ongoing action-based direct mail campaigns that result in higher response and engagement rates due to their precise timing and personalized content. Essentially, an event occurs (mortgage rates change, customer makes a purchase, prospect gets married, etc. ), and a mailpiece is sent to the affected individual specifically regarding their new situation and how the business can solve their issue. The data is processed frequently, usually daily or weekly, so that the prospect receives the message while the recent change is at the top of their mind. As a result, a highly qualified prospect’s attention is captured at the peak of their purchasing or action-taking probability. Industry – mortgage rates increase, etc. Life Stage – change of residence, marriage, etc. Behavior – membership renewal, product purchase, etc. Inquiry – customer service inquiry, contact form submission, etc. Anywhere from a few hundred to tens of thousands of pieces can be mailed out on a daily or weekly basis* using trigger direct mail campaigns. For best results, campaigns are run over the span of months or years, as opposed to a confined timeframe, to reach the ever-changing pool of prospects. We print postcards, letter packages, self-mailers and more for our clients’ trigger campaigns. Variable data printing is often used to capitalize on the personalization of the mailpiece. And our state-of-the-art production equipment produces the highest quality digitally printed pieces without sacrificing quick turnaround time. 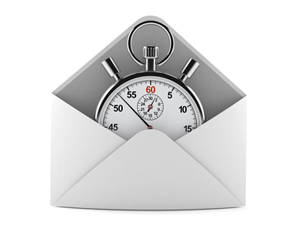 Digital Dog Direct is highly experienced with direct mail trigger campaigns that get your messages out faster. Actual turnaround time depends on many factors including quantity and type of mailpiece. Please speak with one of our Account Executives for more information.